A reinvention of our iconic Pinch styles, the Pinch Weekender LX with Stitchlite™ is our nod to heritage and luxe living. Designed with Stitchlite™, our proprietary technology that promotes airflow and cooling. This silhouette features an all-new modernized design with a higher sidewall profile and reinforced taping at the toe. Great value and so comfortable for casual Friday wear !!!! Love them so much that I got them in colors. Love this shoe. This brand is so comfortable. True to size. Love the light pink. 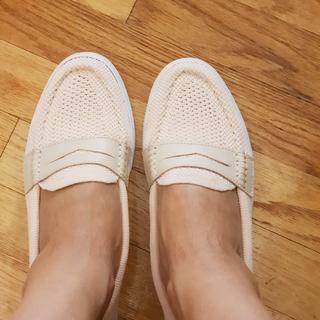 Usually order 6.5 size but previous nantucket knit platform loafer streches a bit with several wearing so 6 was quite allright and this time ordered both 6 & 6.5 . But this stitchlite doesnt strech that much. 6 is a little tight and 6.5 has quite enough room for my feet. Probably my size is inbetween 6 and 6.5. I’ve owned several pairs of Cole Haan shoes and don’t mind paying for true to size comfort in addition to this fun style in go with everything blush pink! I like the shoes a great deal and appreciate the comfort they offer. They are a good boat shoe, casual yet stylish. fHowever, they don't offer a lot of ankle support in the back of the shoe so if you have any foot problems, you may find them rather spongy. These shoes are super comfortable and I stand all day at work. I've received tons of compliments on them too! I would recommend this shoe. It is a casual, clean, look for summer. This shoe is light weight, comfortable and good looking. It is a perfect summer shoe. This will be my tenth pair of Pinch Weekender, I cannot get enough of this loafer! Love the color and look very comfortable. And I love loafer too. Have many different styles of this shoe. Want this for summer. I have a similar item in tan and I love it, very comfortable! It is a beautiful casual shoe. I loved the pink color. Looks like a shoe that will enhance any outfit. Looking forward to receiving them. Classic and hard to find pink! BEST ANSWER: Because of the fabric, they do “ give” a little in a relaxed way. But the leather trim that mimics penny loafer style holds that portion firm. I totally shattered my right heel years ago, and these shoes are very comfortable despite me lacking the main bone for impact in right heel. I have two pair of the pinch weekenders and I would say they stretch just a bit but not to the extent that they are too big. They are comfortable which is why I bought a second pair. I’ve only worn them twice so far and they haven’t. Considering they are fabric, I’m sure they will somewhat. They are super comfy. Feels like I’m walking on marshmallows. A little. I’m somewhere between a 6 and a 6.5. I got a 6 and they’re perfect after a couple of wears. This is my second pair of this style and I love them. I ordered but did not keep this shoe. It is very cute and it felt as if it would stretch. Yes, the fabric part is stretchy like a sneaker. What is the best way to clean the stitch lite loafers? I bought the pink in Boston last week after walking a lot in another pair and they’re super comfortable and light. But... the color picks up all dirt and they are already showing marks after two wears.